Knitted wire mesh netting of Stainless Steel, Brass and Aluminum are popularly used for in various engineering and decorative uses. 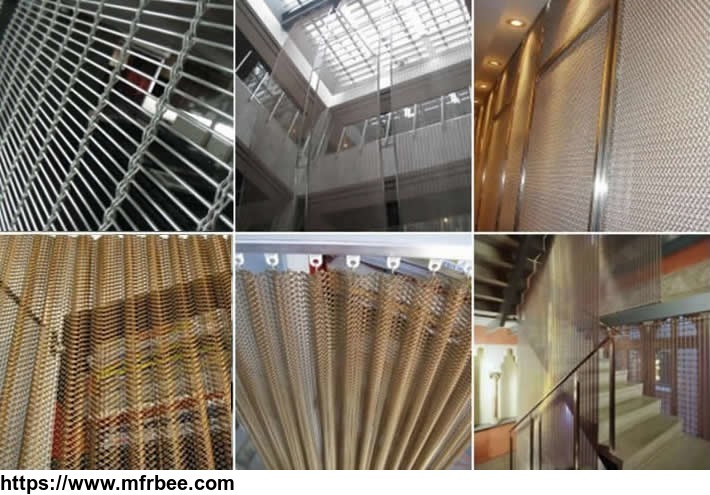 The metal mesh is processed into curtains, facade screen, partitions, wall panels and elevator wall cladding offering modern aesthetic decoration effects. 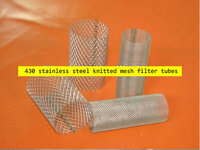 Silver and gold wire are also used for decorative mesh knitting / weaving / processing. Brass Mesh：Decoration Netting for hotels, exhibition halls and other buildings. Size of curtain nets can be customized. We supply woven ss mesh of 314, 316 and 316L for modern designs. Decorative wire mesh is a new decorative materials in the modern construction industry and widely used as curtains in house, screens for dining hall, isolation in holes, ceiling decoration, decoration in trade fair exhibition and retractable sun light protection, etc. Chain link curtains we supply are applied for partition, ceiling in airport, hotel, theaters, and exhibition decoration. Available in copper, aluminum and stainless steel, also color painted metal. Chain link decorative mesh features excellent flexibility, cornering function, and light weight. Metal Mesh Curtain of Aluminum Wire Diameter: 1.2 mm , 1.6 mm, with Black Powder Coating. Knitted Wire Mesh Screen (Stainless steel, brass ) for Architectural Decoration. Knitted wire mesh of crimped wire are popularly used in decorations of exhibition halls, hotels and luxurious room decorations as screens, also inside and outside decorations in superior office buildings, dancing halls, business halls, shopping center and sports center, ceilings, walls, stairs and railings. Material: Stainless steel wire (AISI304, AISI316,AISI316L); aluminum alloy, brass, copper or other alloy materials. Good flexibility, strength with its versatility, unique texture, variety of colors, aging resistance, sunshine resistance, weather resistance. Degrees of transparency and flexibility and suit able for both interior and exterior applications. Decorative architectural wire screen is populary used for dining hall, isolation in hotels, ceiling decoration, animal containment, stair channel, high grade interior decoration of hotels,wire mesh facades, partition and isolation screens, staircases isolation screen, elevator cabins screen, floor covering fabrics, shade screens, shower curtains, lamp screen, metal draperies for walls.